Another of the amenities that have made Oman and the UAE such a pleasure to travel is the regulation that bans trucks from the road during the morning and afternoon peak traffic hours. I took full advantage of that this morning being on the road during that full two-hour window from 6:30 to 8:30 as I made my much dreaded entry into Abu Dhabi. I knew that if Abu Dhabi was anything like Dubai and Muscat I was in for a blizzard of vehicles. The fewer I had to contend with the better, especially with the many exit and entry ramps the urban environment would deal me. The exit and entry ramps started coming at mile intervals. Few vehicles were exiting and those entering were staggered enough that I only occasionally had to stop and wait for a gap before I could resume riding. At 7:30 the traffic began backing up at a major merging point. I was happy to see it, as I could cut through the gridlock across two lanes of traffic to the bridge I wanted to Abu Dhabi, which is an eleven mile by eight mile island. Three bridges connect it to the main land from which I was entering. I didn't know how perilous those bridges would be for cyclists. As I approached the one I had chosen, it appeared as if there was still a shoulder. And then I noticed an actual sidewalk. 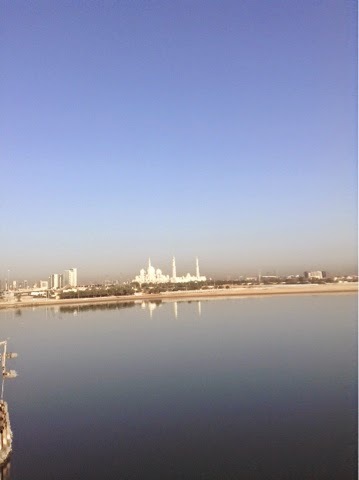 It wasn't a towering bridge and before I reached it I saw a cluster of domes and four towering minarets of a mosque. 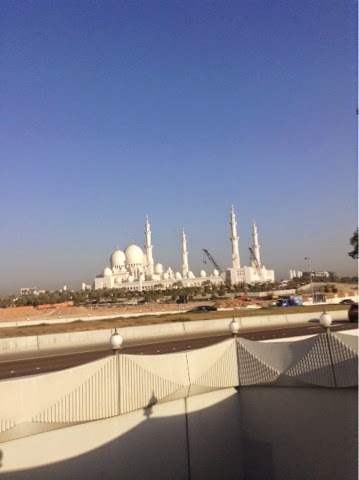 It was so striking I knew it had to be the Sheik Zayed bin Sultan al-Nahyan Mosquep, the Grand Mosque of the city. 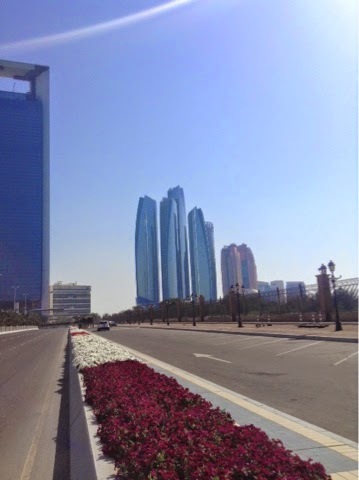 My friend Dudley, frequent commenter to the blog and an inveterate world traveler from Australia, who I met in the Philippines a year ago, had told me it was the one must-see sight in Abu Dhabi. Lonely Planet agreed. I didn't realize it was on the outskirts of the city. I was happy to have it fall right into my lap. It was eight a.m. I had knocked off eighteen miles and had another ten to the other must-see sight--the corniche (coastline) on the far end of the island. Those next ten miles would still be hectic, but I would have options. I was greatly relieved to have crossed on to the island with a minimum of hassle and peril. I could relax for the first time of the day. 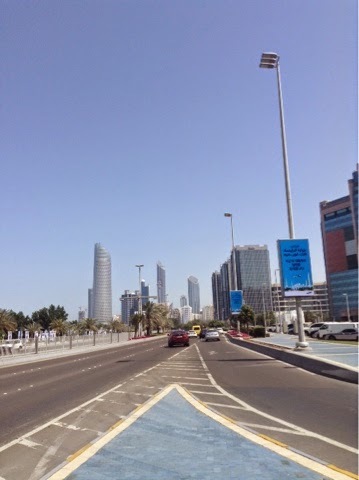 I had been dreading getting into Abu Dhabi for days, and it had turned out to be not so bad. The closer I got to the mosque the more magnificent it looked. 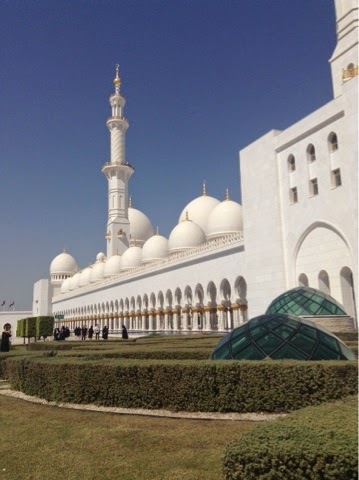 The mosque was conceived by the late Sheik Zayed, known as "the father" of the UAE. It was completed in 2007, three years after his death and eleven years after its construction had begun. It is one of the largest and most striking mosques in the world with eighty-two domes and space to accommodate fifty thousand worshippers, ten thousand inside. I had to wait until nine before I could gain entry, giving me time to have another breakfast and change into long pants. While I sat in the shade by the entrance, cars began backing up. Two women got out of one to give me a query. One was fully covered in black, other than a slit for her eyes, while the other let her hair flow for all to see and wore slacks and a sweater. The one dressed Western-style was from Toronto visiting her mother. They had driven from Dubai, over one hundred miles away, this morning to see the mosque. 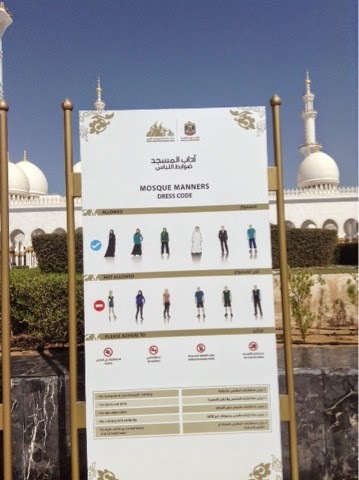 A strict dress code was posted at the entry to the grounds of the mosque. Those who weren't in compliance were provided with approved attire--men a white robe and women a black robe and scarf. Free hour-long tours were offered. 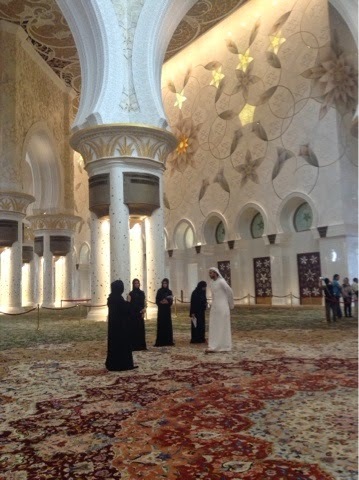 The tour was as much an introduction to the Islamic faith as it was a commentary on the mosque. Everyone removed their shoes before entering the mosque and its carpet--the world's largest Persian rug. It took two planes to fly it over from Iran. 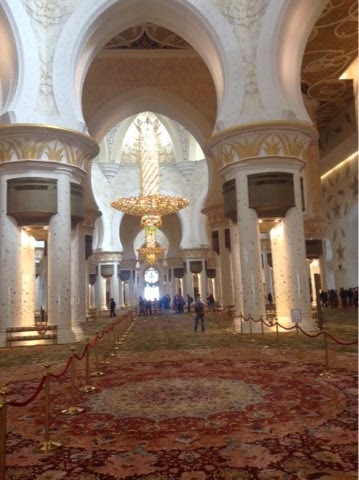 The mosque is also noted for its seven huge chandeliers. The largest weighs twelve tons. It is cleaned twice a year. The mosque and its grounds were mobbed with tourists from all over the world. Tours are only given in English, but there were head sets providing commentary in eleven languages. It was distant from the urban center and its handful of skyscrapers. Even though Abu Dhabi is by far the largest and most affluent of the seven Emirates, it hasn't gone skyscraper-crazy as has Dubai. A minimal scattering lined the highway along the cornich, in contrast to the multiple forests of skyscrapers in Dubai. As those of Dubai many were exotic. 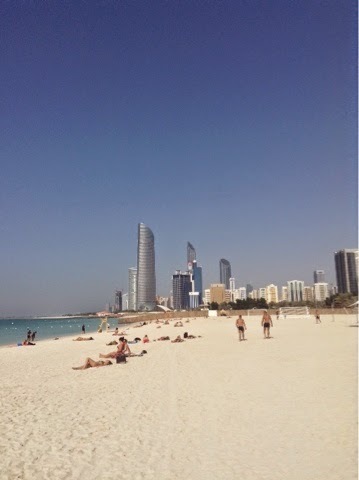 Dubai had nothing to compare though to Abu Dhabi's string of beaches for several miles along its central district. Bikinis were allowed on the beach but not beyond. A bike path ran for five miles along the waterfront from the ultra-opulent Palace Hotel, that did not allow bicycles on its grounds, to the harbor and an array of wooden fishing boats. Across the bay from the beaches were a few more tourist attractions--a huge mall, a theater and a Heritage Village with small museums and craft shops and the opportunity to ride a camel. Arriving so early to the island I had time to soak in its offerings and get a good enough sense of it to know it was a place I would much prefer to return to than Dubai. I had arranged for a hotel, but felt I had gotten an adequate dose of the city, that I needn't linger and could make an escape back to the desert, which I was already missing. But I was also committed to making another attempt on talking to Janina? We had been thwarted all too many times since I'd left Chicago, so had to resist the lure of the sand. But once again FaceTime failed us, even though I had proved it was viable with the Afghanis several days ago. I emailed Janina and told her I would go in search of a phone card as my hotel room had a phone. I learned that those sold here only worked with mobile phones. When I reported the discouraging news to the concierge he offered his. When I returned to the store that sold the cards, they said they only sold cards for India. I continued my search stopping in at half a dozen more stores, being sent from one to another, before I found one that sold cards for the US. By then it was well after dark and ninety minutes since I had emailed Janina that I would resort to the phone. I had wandered through a warren of streets and through a couple of malls that were modern-day souks and had lost my bearings. I feared I would have to hail a taxi to find my way back to my hotel. But after a couple of blocks I recognized a landmark. By now Janina had been waiting for two hours and would soon have to leave for Columbia to play professor. I caught her in time and all the effort to track down a phone card was rewarded, except that the card didn't even last ten minutes. Let us know your route to Dhubai, please George, so I can follow on Google Maps. There are tourist desert camps which suit those preferring more facilities and other activities. Some you might pass. Dud: I was planning on sticking with highway 11. I don't need to push it so could stop before dark to camp. Admire your spirit George ! Think i will stick to the Tour Routes , at least in Europe i should know where i am going . An Aussie trifecta--Dud, Vincent and Skippy. Just needed Andrew to round it out. That Aussie mateship thrives.